KATHMANDU, April 8: The much-awaited India-Nepal pipeline project has been launched jointly by Prime Minister KP Sharma Oli and his Indian counterpart Narendra Modi amid a function held at Hyderabad House, New Delhi. 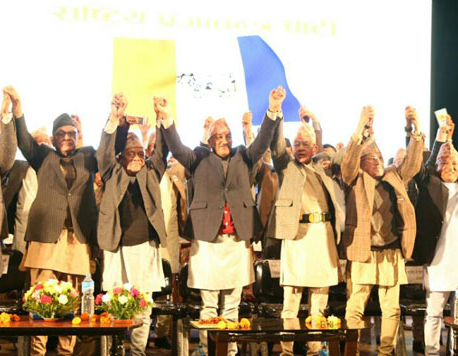 They participated remotely in the ground-breaking ceremony marking a formal start to the laying of the cross-border pipeline from India's Bihar state to Nepal. The 69-km pipeline from Motihari in Bihar to Amlekhganj in Nepal will have a capacity of supplying 2 million tons of petroleum products per annum. The project is estimated to cost Rs 4.4 billion. Under a previous agreement between Nepal and India, India will finance Rs 3.2 billion of the cost and the Government of Nepal will contribute Rs 1.2 billion . Indian Oil Corporation (IOC), the Indian government-owned oil and gas company which supplies petroleum products to Nepal, is implementing the pipeline project while Nepal's oil monopoly Nepal Oil Corporation (NOC) will requisition land for the project on the Nepal side. The laying of the pipeline is, however, already underway. NOC officials say that the pipeline project will be completed in 30 months. According to them, Nepal can save over Rs 1 billion annually in transport cost and reduced technical loss once the pipeline comes into operation. Though the project was initially meant to construct a pipeline from Raxaul to Amlekhgunj, this was later extended to Motihari after IOC shifted its depot from Raxaul to Motihari. Nepal has been requesting the Indian government to extend the pipeline to Kathmandu from Amlkehgunj. Leaders of both countries have hailed the project as 'another step towards strengthening' India-Nepal friendship. “The pipeline will ensure continuous and uninterrupted supply of petroleum products to Nepal, fulfilling its energy requirements completely and will further boost bilateral relations between the two countries,” said Indian Minister for Petroleum and Natural Gas Dharmendra Pradhan in a tweet. The cross-border pipeline project was first proposed by IOC in 1995. However, its implementation has moved at snail pace largely due to skepticism in Nepal over its smooth operation. The two countries did ink an agreement in August of 2015 to construct the pipeline. Once it is laid, the pipeline is estimated to reduce fuel transport cost by 40 percent, something that is expected to greatly relieve Nepali consumers. It is also expected to generate additional revenue for the government, reduce technical loss, oil theft and road deterioration, besides making oil supplies cleaner and cheaper. The pipeline project is also expected to reduce the long queues of trucks carrying petroleum products at the Birgunj border. Nearly 1,500 trucks have been transporting petroleum products to Nepal. NOC has long argued that the pipeline will help end fuel shortages.